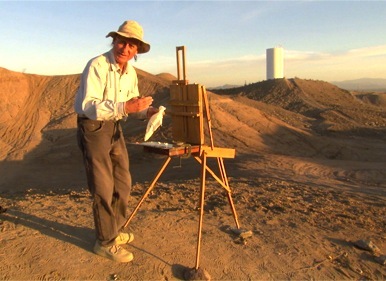 An new video documents painter Rackstraw Downes painting on site in Presidio, Texas. Speaking about his attraction to the area Downes comments: "I'm interested in landscape where people have acted upon it. I grew up in a landscape like that. England is very lived upon... The American romance with the untouched landscape is foreign to me. It never exactly hit me, and I like the landscape that has been modified. It's ok, people aren't so bad and they go in there and they do these things and some of these things are rather wonderful. This is one of those places to me."